GUM Eez-Thru Angled Flossers | Sunstar Americas, Inc.
GUM Eez-Thru Angled Flossers Sunstar Americas These flossers effectively remove plaque between teeth and feature an angled head to help reach back teeth. 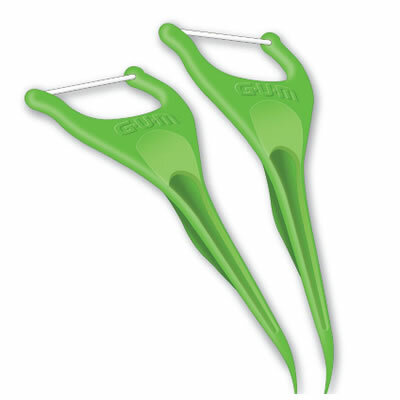 Sunstar Americas has made it easy for patients to floss more frequently with their convenient GUM Eez-Thru Angled Flossers. With an angled head that allows for easy access to back teeth and an “extreme” mint flavor, Sunstar reports that GUM Eez-Thru Angled Flossers transform the most neglected oral care habit into a simple task. According to Sunstar, the GUM Eez- Thru “super slick” floss slides easily between teeth, virtually eliminating shredding, the most common complaint about standard floss. Fresher breath is achieved through the pleasant mint flavor and the removal of odor-causing plaque. Recommended by many dental professionals, this floss is available at retail in 75 count packages.